 Wilderness Safaris News - Info and updates from Wilderness Safaris.  North Island Dive Report from the Seychelles.  Monthly update from Zibalianja & Selinda Camps in Botswana.  Kwando Safaris game reports.  Monthly update from Jack's & San Camps in Botswana.  Monthly update from Duba Plains Camp in Botswana.  Monthly update from Vumbura Plains in Botswana.  Monthly update from Ongava Tented Camp in Namibia.  Turtle news from Rocktail Bay in South Africa.  Monthly Dive report from Rocktail Bay in South Africa. After a dry November, we finally had some decent rain in December with a total of 90mm. The min/max temperatures for the month averaged 19 and 34 degrees Celsius. Good leopard sightings continued into December with the Motseletsele Female and her two growing cubs providing regular sightings. The female cub is very inquisitive and approaches the vehicle to sniff the running boards as she inspects the occupants. The male cub is much bigger and the size difference is quite noticeable at a year old. He is slightly shyer but has grown in confidence particularly during the last two months. We witnessed an interesting chain of events one afternoon, involving the male cub and a troop of baboons. When we first found him, he was lying flat on the side of a termite mound watching some impala grazing. He was very focused on the impala and did not pay any attention to the local baboon troop feeding a couple of hundred yards away. It was only a matter of time before the ever-alert baboons spotted him. When they did, a big male baboon immediately ran at the leopard and chased him into some thick bush. The leopard hid for a few moments before the baboon flushed him again. This time the baboon was only a few metres behind the leopard and chased him for a long distance barking all the way. The leopard disappeared into a very thick palm scrub and the baboon went up a nearby tree to get a better view. He was soon joined by two other big male baboons that kept staring at the thick palm bushes and barking their agitation at the hiding leopard. 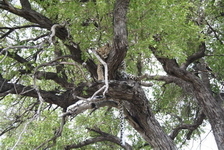 They eventually came down the tree and approached the place where the leopard was hiding, circling it. There was nowhere for the leopard to go, he was cornered. The baboons soon realised that a cornered leopard, even if not full-grown, is not to be toyed with. The leopard stood his ground and gave a series of intimidating snarls and growls. This tactic seemed to work as the baboons did not want to risk going into the thick scrub after the leopard and they eventually lost interest, giving the leopard the chance to make his escape. The Mopane Ridge Female is lactating, which means there is possibly another small litter of very small leopard cubs hidden away in her territory. She is keeping a low profile at the moment but we are very excited to get a glimpse of the new additions to the family. She successfully raised two cubs last year that are now independent, hunting on their own and are doing very well. We have also had good lion sightings in December; one lioness killed a wildebeest right in front of camp. She cleverly hid it in the Tsaro palm island so that not even the vultures could find it. She fed off it for four days leaving only skin and bone for the hyaenas. That evening she met up with one of the resident males, the poor chap did not know he had just missed out on some fine dining. The territorial male wildebeest who spends his days on the floodplain in front of camp was joined this month by a herd of females with young calves. The calves are very entertaining to watch and spend their time either sleeping or chasing each other between the legs of the females. The warmth and moisture have brought many 'termite showers' which have provided food for numerous birds and rodents. 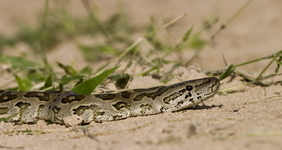 These conditions are ideal for many reptile species, this month we have seen Rock Python, Snouted Cobra, Spotted Bush Snake, Stripe-bellied Sand Snake, Rock Monitor, Kalahari Sand Lizard and Dwarf Geckos in and around camp. Bird species seen include Striped Cuckoo, White Stork, Western-banded Snake Eagle, Black-breasted Snake-Eagle, huge flocks of Woolly-necked Storks, Grey-hooded Kingfisher, Bearded Woodpecker, Black Flycatcher, and African Rail. Big flocks of Marabou Storks have been active in the marshes, feeding on trapped fish in the small remaining pools of water. Night drives have produced several sightings of porcupines, civets, genets and honey badgers, many Owl species and one sighting of the resident male leopard that is very rarely seen. Looking forward to seeing you out here! What a wonderful end to a fantastic year, here in the open wilderness, nestled on a lonely island in the heart of the Okavango Delta. The island is covered with thick stands of beautiful reds of the 'Fire ball lilies' and many different greens of the newly budded leaves, in preparation for the vigorous growth over the next few months before the rains come to an end. The camp is filled with many different and melodious sounds from the birds with their recent new nestlings like the Crested Barbet, White-browed Robin Chat (Hueglin's Robin) and Paradise Flycatchers which we have seen all over the place. Some of the evenings have been filled with many little fairies (winged termites), and there has been a real insect boom as the month has gone on, due to the fact that the rains have really started falling. This is not a daily occurrence but it has been overcast and very cloudy, considerably cooler this December compared to previous years. This however did not dampen the spirits of our 'Journey Seekers' as they just took it all in their stride and were all part of the wonderful adventure. "Look! There is a white branch in the Leadwood tree. It looks like it could be the tail of a leopard..."
The leopardess seems to be staying out of the way of the lion pride since the fateful day her cub was killed. This has made it really difficult for us to find her. There have been a few, but wonderful opportunities where she has either been seen on the move, hiding or just lying up in one of her favourite trees. She is possibly almost ready to find a mate again, to see if she can try to raise a new cub successfully. Another female leopard has been seen with her cub, to the western side of the concession, on a few occasions just walking in the road and then playing around in the nearby bushes and trees. The cub is about 8-12 months old it would seem but is not camera-shy like its mother. Scattered along the dry and sandy plains in front of camp the zebra, wildebeest, red lechwe and tsessebe stay quite close to the water and the reeds, which is fair distance away at the moment. The young of most antelope species are really doing well, timing of births last month came at the right time and there is plenty of cover to hide away from the predators and also a lot of food around. The resident lion pride's two females and two cubs are predominantly seen with both the males at the moment. The competition is still very high within the pride when they are feeding as many of the kills are smaller antelope like red lechwe and on one occasion a fairly large baboon. Many of the kills that the lioness made are stolen by the males and they fight off all who come close. This leaves the cubs at the bottom of the dining list but in spite of this the whole family is really healthy. There was a bit of a concern as the smaller one of the two cubs has been wounded during one of the feeding sessions. The cub has a large wound but has done really well to survive and the wound is healing very nicely. The larger cub is really dominating the smaller one at the feeding sessions and often keeping her at bay when eating some of the smaller prey not stolen by the males. The pride is moving larger distances as the cubs are more mobile, even crossing over large expanses of water to the north to keep the other prides away from their area or maybe in search of some of the larger prey species like buffalo or zebra. Back in camp, we all really enjoyed the Christmas celebrations - both the wonderful Christmas staff party (9 and 10 December) and Christmas Day. The resident monkeys and baboons also enjoyed the Christmas period but mostly the Christmas tree which they knocked over, playing in branches and eating many decorations. Not a very good example for the youngsters! We had a great African Christmas tree in the bush. We even had a Spotted Bush Snake that was hunting the small frogs in and out of the lodge and terrace area. We look forward to sharing the new year's adventures, laughter and fun. May your 'Life's Journey' bring you to this paradise, in the heart of the Okavango Delta. The last week of November and first week of December has been a great time at Duba Plains. The area received rainfall for the first time this rainy season. This has generally led to a sudden change in the area's general game sightings, especially of elephants. Elephants have been seen in big herds, ranging from 30 to 40, that have moved into the concession from the south-western side, en route through Duba towards the Mopane woodlands further north. These were spectacular and memorable sightings and on several occasions the herds were caught on camera as they crossed the deeper water channels in single file. Generally at this time of year sightings of elephant herds change from regular viewing of larger herds to less regular viewing of smaller herds as the rainwater pans in the Mopane allow dispersal away from the permanent channels - this year may be slightly different however, since rainfall has been late in arriving and also not as abundant as expected. During one evening recently there was an unexpected sighting in the area as well. The sighting caused arguments, confusion, debate and almost conflict between the guides due to the identification of a strange male lion that was seen in the area. This male was in very poor condition and badly injured and was initially mistakenly identified by the guides as one of the Duba Boys who has not been seen for some time and when last seen had a bad wound to the back leg. As the sighting progressed, the guides were surprised and shocked as to why the Tsaro Pride and the other Duba Boy did not allow this male to approach them, and in fact actively avoided him, keeping a distance between them and growling aggressively at him. The fact that it was already dark at this stage made it difficult for the guides to confirm the ID and age estimation, but on returning to the area the next day the same male was still following the pride, albeit at a distance. Given the benefit of daylight and the presence of James, resident guide for the past 10 years and intimately familiar with the area's lions over time, this male was identified as one of the five Tsaro Males that had been evicted by their fathers (the Duba Boys) in September 2003. This male was seen only for two consecutive days in the concession and then disappeared and has not been seen since. Three of the Tsaro lionesses, including the silver-eyed one, are heavily pregnant and expected to have cubs any time this month. The number of surviving cubs in the pride has decreased from five to four, with one cub lost to unknown causes. Surprisingly, the Skimmer Pride has not been seen much in the territory of the Tsaro Pride and they seem to have curbed the invasions which took place over the past three months. Instead while the Skimmer Pride territory (Paradise Island) is still inaccessible to vehicles because of high water levels, they have only been seen in an area of overlap between the territories of the two prides, along the regular route used by the buffalo herd. As a result of successful buffalo defensive strategies during daylight we are still continuing to see more interactions between the lions and the buffalo than actual kills. This has caused the lions to keep trying their luck through the night and they successfully made two kills after dark during the past two weeks. Only one kill was witnessed during the day. Aardwolf and bat-eared foxes have continued to be among the highlights since they are rarely encountered elsewhere. At Duba Plains sightings are regular. In previous reports we mentioned that one pair of aardwolves had a den with two pups. These pups have now matured and have left the den although they are still being seen in the general area. The rainy season is in full swing with significant rain falling throughout the Vumbura area in the form of aggressive thundershowers. This has triggered an explosion of life in the Delta with frogs of all shapes and sizes emerging. Following these amphibian snacks are a multitude of storks and birds of prey. Another natural phenomenon this month has been the winged termite emergences taking place after each rain storm. We had wonderful viewing of our resident small spotted genet snatching up these protein-rich bites in our main lounge area. The vegetation has erupted, transforming the Vumbura area into a lush Garden of Eden. Mushrooms have sprung out overnight in every possible location, including the great Maboa mushroom. This giant fungus is much sought-after by moths, animals and humans alike who enjoy its fleshy taste. On the birding side, our full complement of permanent residents and migrants are pleasuring all with a birding interest and all groups of birds are in great abundance at the moment. The rains have formed pans and extended puddles making the area irresistible for water fowl such as Knob-billed Ducks, Spur-winged Geese, Pygmy Geese and the rest of the water-loving feathered community. Lion sightings have been as good as it gets this month, with quite a bit of action happening in the Vumbura Pride lands. The four sub-adult males of the Kubu family have been kicked out the pride by the two dominant males. These young boys will become a small nomadic group roaming northern Botswana until they can find a place in the complex world of lion society. A number of interesting kills have taken place this month including a 5-metre crocodile. We found the Kubu Pride feeding on this monstrous prehistoric reptile one evening. The events preceding this are still unknown but the crocodile must have been mortally wounded in a territorial dispute before the lions found it, making it an easy target for them to take on. The Big Red Pride was also very successful this month, taking down a fully grown giraffe which they defended and fed on for a few days. The cubs in both resident prides are still all well and healthy, providing us with stunning sightings of these small fury cubs. Cheetah sightings have been plentiful this month. Our resident male has been spotted a number of times around camp, killing an impala in front of our Boma one morning. This male has been roaming around camp and to the east, which is unusual for him: Possibly the result of lion pressure from the west. Leopards have been scarce but one sighting sticks out above all animal sightings this month. A young female leopard was spotted in front of camp one evening. She was hunting impala but unfortunately did not bring one down. We followed her for a while when all of a sudden she came face to face with a cheetah. The two spotted cats watched each other for a while not quite knowing how do handle the situation. Suddenly both cats looked to the north only to see a hyaena trotting in to join the party. There they stood; a leopard, a cheetah and a spotted hyaena not 10 metres apart from one another. Without a sound they all turned away and each headed in a separate direction: True Vumbura Magic! Wild dogs have come through the area 3 times this month. These energetic creatures are always on the move and it makes them difficult to follow. But nonetheless we witnessed two wild dog kills this month which is fantastic. The wild dogs never stay in the area for more than two or three days and their presence is always welcome. Hot, hot, hot... that's what describes our Christmas Season - hot! The trees are in full leaf and the seeds of the Purple Pod Terminalias are starting to redden, casting a festive atmosphere throughout the reserve. New grass pushes up from the earth after the first showers of the season and quickly lures the animals out onto the open plains. Plains game abounds at the waterholes and on the open plains, riveting everyone by their sheer numbers. White rhino sightings have been extremely satisfying and our famous "Long Horn", an enormous female white rhino, has allowed us to get up close on foot to view her and her newborn calf. Black rhino sightings have been scarce but we have been rewarded with some fantastic leopard sightings at camp and at the Margo waterhole. Lions seem to be under every shady tree and at every waterhole, waiting patiently for some unsuspecting antelope to come by. Great lion hunts have been observed this month, which in turn makes the conversation at dinner most interesting, hearing everyone's version of the events. Brown hyaenas have made their presence felt in camp, wandering between the tents and observing everyone having dinner whilst standing at the entrance to the lapa. In Etosha, the game viewing is not much different from the Ongava Reserve. The sheer number of animals leaves one totally awestruck. Elephant sightings have dwindled somewhat as they start their annual migration to the north-eastern part of the Reserve. Black rhino have been seen on occasion close to Gemsbokvlakte. The "Culvert" lions at Newbronnii still captivate all those who travel along that road looking for the cats whilst the gemsbok, zebra and springbok give the culverts a wide berth. Birding always remains a delight. Martial Eagles, Tawny Eagles, Pale Chanting Goshawks and Greater Kestrels are easy to spot as they perch in the Mopane trees. A very unusual sighting was a Montagu Harrier en route to Okaukuejo from Gemsbokvlakte. Another rare sighting at Ongava was a Cape Griffon Vulture at Allen Dam, which sent the birders into a frenzy in their haste to haul out the binos and tick their books. Swallow-tailed Bee-eaters and Lilac-breasted Rollers beautify the surrounding trees and the truly massive numbers of the Red-billed Queleas astound even the most ardent twitcher. Huge flocks darken the skies over the waterholes, weighing down branches and flattening small bushes as they perch before setting off once again. The campfire lit, smoke wafting through the trees as the crickets start their evensong, wonderful aromas wafting from the kitchen ends another perfect month in paradise........Ongava. Much like October and November, December has been extremely hot and very dry, with many days going up into the forties. At one point the Luvuvhu River got so low in places we thought it was going to dry up into patchy pools here and there, as it did last year. Rainfall in the catchment area kept things flowing however and this combined with the lack of rain locally saw the importance of the river for game being as obvious as during generally drier months such as October. Towards the end of the month around the 29th the rains finally broke and we had 5mm. Then between the 30th and 31st we had an amazing 60mm and what a relief it has bought to the area. The temperatures have cooled down quite nicely, so far. The vegetation is already starting to change for the better, and the Luvuvhu River is now flowing bank to bank and the Limpopo looks stunning. Possibly linked to this dry period has been an interesting phenomenon. Whether it is due to desperation or due to everything being so dry no one can tell, but we have had quite a few incidents where we have witnessed large male baboons killing young impala, bushbuck, and even a young nyala, in the most gruesome ways and then continuing to feed on them. I know this is not that unusual as we know baboons have been seen many times feeding off carcasses and even making the odd kill themselves, but it is the first time I have witnessed it happening so often. At the beginning of December, we were also thrilled to host the second Children in the Wilderness programme here at Pafuri, with the children hailing from the nearby Makuleke Village. The staff were over the moon to be with the children and a lot of fun, games and education was had by all! We are already planning for next year! Here are some of the sightings our guests have been treated to during December. There have still been some good sightings of breeding herds of elephant, large herds of buffalo, as well as many lion sightings, including the resident male mating with one of the lionesses. Other sightings include: blacked-backed jackal, African civet, white-tailed mongoose, Burchell's zebra, yellow spotted rock dassie, bushpig, blue wildebeest, klipspringer, Sharpe's grysbok, eland, scrub hare, and rock elephant shrew. There have been 234 species recorded this month with some real gems including the first-ever nest site of a Racket-tailed Roller in South Africa. Other sightings for the month include: Southern Ground Hornbill, Purple Roller, African Pygmy Kingfisher, Woodland Kingfisher, European Bee-eater, Blue-cheeked Bee-eater, Southern Carmine Bee-eater, Red-chested Cuckoo, Three-banded Plover, European Honey Buzzard, Steppe Eagle, Rock Kestrel, Amur (Eastern Red-Footed) Falcon, African Darter, African Spoonbill, Red-backed Shrike, Lesser Swamp (Cape Reed) Warbler, Willow Warbler, Village (Steel Blue) Indigobird. Climate: Ave/min temp: 24°C. Ave/max temp: 39°C (highest was 44°C). Rainfall 65mm. What a way to end off a fantastic year! With all the great festivities, great people to share them with, and of course great sightings of turtles, we have had an unbelievable December. Our first little Loggerhead of the month was seen on the 3rd of December. Douglas and Christine Hall joined in on the research drive that beautiful starry night, and were not disappointed. At the far end of the research area, at pole no. 100, a new Loggerhead mother had crawled out of the sea and started digging her nest. As Gugu approached her tracks, he turned the vehicle lights off, and crept out of the car, and up to her to see how far she was. When she started laying her eggs, he called everyone up to witness the special event. Gugu then tagged her with the tag number ZA RR528, and took her measurements which were 80cm long by 70cm wide. Douglas and Christine were so awestruck by what they had just witnessed that they just had to adopt her. Her new name is Zippy the Loggerhead. Our first Leatherback of the month was seen the very next night, and what an impressive sight she was. Gugu came across her tracks just after Pole 96, which is very close to the end of the research area. After discovering that she had no tag, Gugu tagged her and then took down her impressive measurements. This Leatherback measured in at 1.6 metres long by 1.2m wide - remarkable! Teagan Smith, along with her family, had joined the drive that night and could not believe what she was seeing. She just knew then and there that she just had to adopt this magnificent creature. She christened her Tiggy, which is actually Teagan's nickname; her tag number is ZA RR540. Teagan's brother, Kyle, was too late to adopt Tiggy, but his chance came two nights later on the 6th of December. Just after nine o'clock Gugu came across the tracks of a Leatherback on the northern side of Lala Nek beach. The Smith family was on the drive again that night, and could not believe their luck. This Leatherback Turtle was also a new mother, and although smaller than Tiggy, no less special. She was tagged with tag number ZA RR541, and she measured in at 1.53m long by 1.14m wide. This Leatherback is now known as Lizzy the Leatherback Turtle. So, Brent and Michelle arrived at Rocktail with two children, Teagan and Kyle, and left with two children and two "grandchildren", Tiggy and Lizzy. Thanks so much for showing such great support and interest! Our largest Leatherback mother during December is now known as Sandy, and she is the proud newest member of the Dwyer family from Johannesburg. The Dwyer family and the Simpson family went on a midnight drive on the 12th of December, and were fortunate to come across Sandy while she was nesting on Manzengwenya beach. Gugu measured her in at an astonishing 1.7m long by 1.3m wide. INCREDIBLE! The Williams family definitely had a Christmas to remember! After indulging in a Christmas feast, they took part in the turtle drive that night. Just after one o'clock in the morning (technically Christmas morning), they came across a little Loggerhead turtle on Manzengwenya beach. She was the only turtle that was seen on the early hours of Christmas morning, and so they just had to adopt her! This turtle was adopted for a very special reason, and we thought that she should get a special mention. Phil, Gilly and Jonathan named this little Loggerhead Ben, in memory of their son and brother that passed away at the beginning of 2006. Phil, Gilly and Jonathan, this special turtle will stick in our minds forever, and we will keep a special eye out for her. Thank you for adopting her and we hope she brings you lots of joy. Overall, December has been a fabulous month to end off a fabulous year! Turtle adoptions continue to come in, and we had a terrific 15 turtles adopted throughout the month. The end of December marks the halfway point through out turtle research season. We still have a further two and a half months of research to conduct, and hopefully soon we will be seeing those special little products of all this nesting - the hatchlings! Here's wishing you all the best for 2007. We could not have asked for a better way to end the year. Loads of fun, loads of sun, loads of sightings and of course loads and loads of great people to share it all with. The weather this month has been hot and humidity levels have risen to their highest yet. It has been absolute perfect weather for the beach, snorkelling and diving. With all this heat going on around us, we were certain that a storm would come to flush away the heat, and replenish the steaming earth. On the night of the 17th of December, an almighty thunderstorm hit Rocktail. It was one of those storms that we do not see very often, but when it happens it is inevitably loud and long. The wind blew, the lightening flashed, and the rain came pouring down. When things finally calmed down in the morning, we had had an incredible 45mm of rain during the three-hour chaos outside. Now, no one thought that another storm like that would come through again for quite some time, but we were totally wrong. The very next evening, and around the same time in the early hours of the morning, another thunderstorm hit the coast along Rocktail. This one was even worse than the first, and we can assure you that our guests were very grateful for their tree-house chalets that night. The wind howled, the thunder roared, and the rain came down in buckets. Once again, once it calmed down and the sun shone brightly, we discovered that we had had a further 50mm of rain. Unbelievable! This now leaves us with the total rainfall at Rocktail for the year 2006 at 1420.05mm, which is 202.05 over our mean annual amount of1200mm. Besides those two out-of-this world thunderstorms, the weather has been amazing, and the ocean even more so. And just when you think things cannot get any better, Neptune just has to prove us all wrong. It was the 7th of December and a boat excursion was on the cards for the Smith and Mostert families from Johannesburg. Shortly, just after launching the boat, Darryl spotted a pod of bottlenose dolphins, frolicking in the waves. The guests on the boat did not hesitate and jumped in with them straight away. Just after that, unbelievably, Darryl spotted an eight-metre whale shark. As you can imagine, some were hesitant at first, but eventually everyone got in, to swim with the largest fish in the ocean today. We could literally hear the vehicle buzzing on their way back into camp, and once they had arrived, they inundated us with all their stories. What a wonderful way to spend a summer morning. Other sightings from the ocean this month have been honeycomb stingrays, devil rays, green turtles, loggerhead turtles and finally our special pregnant female ragged tooth sharks, which are currently resting in the cave underneath Island Rock. Around camp, as usual, a lot of hustle and bustle has been going on. Last month we mentioned the baby boom within the vervet monkey troop, and unbelievably they have not stopped. We are seeing new vervet babies almost on a daily basis. They are great fun to watch, and have been providing our guests with hours of entertainment. Other babies that have been spotted included a nest of Tinker-Bird hatchlings, which Andrew heard calling from a hole in one of the Marula trees around the camp. As we got a closer look at what all the squawking was all about, we saw two little wide-open beaks poke out of their hole - they obviously thought that we were "Mum", hence all the squawking. Another special bird that we have seen this month is the Violet-backed Starling. He, with his beautiful shimmering purple plumage feathers, was seen at the Lodge bird hide. Well, of course, December is also that special time of year, where families and loved ones get together to celebrate the holidays. We celebrated in true Rocktail style with a Christmas Eve dinner which would make any mediaeval feast look like a snack. There was turkey, gammon, Champagne, and of course, there were lots and lots of laughs, late into the night. Christmas morning called for a later than usual start, and after discovering that Santa had actually found his way to us, we saw in the day with a brunch fit for kings and queens. After brunch our guests treated themselves to a dip in the cool waters of the Indian Ocean, which was absolutely flat and crystal clean. All in all, as one guest said, another "terrible day in Africa"! Lastly, we saw in the New Year with a themed "Shipwreck" party. We had a Thai-style dinner, and the cocktails flowed feely through the night. It was much earlier than midnight when the champagne started flowing, and flowed right through until the new hours of the 1st of January 2007. A totally fabulous celebration made special, by the guests who joined us that night! To all that were here that night, we want to thank you for helping us see 2006 out and welcoming 2007 with a bang! John and Marina - South Africa: "Thank you to all of you for making our stay at your beautiful lodge most memorable and unforgettable. Great diving, beautiful and remote location, great turtle viewing and excellent service!" Brent, Michele, Tiggy & Kyle - South Africa: "We love it! We have had an awesome family holiday. The swim with the dolphins the best. Thank you all for a fantastic time!" Marius and Marieke - Netherlands: "Our stay at Rocktail Bay Lodge started with heavy rain, but ended in pure happiness. Thank you all for this beautiful experience." Kevin, Karen, Oliver & Jayden - South Africa: "Excellent service, food and hospitality...we had a relaxing family holiday. See you all soon, we hope?" Gilly, Phil and Jonathan - United Kingdom: "Fabulous! Thanks most of all to the staff for making us so welcome. A unique experience." We hope everyone had a peaceful and fun festive season, and we are sure that, like us, you cannot wait to see what the New Year brings! Here's wishing everyone all the best for coming year of 2007!